Two great Atomos products in one great money-saving bundle! The Atomos Twin Kit bundle is a cost effective solution to monitor and record using two Sumo19 units at the same time separately or together. The Twin Kit bundle is available for a limited time only. Atomos Sumo is the worlds most advanced Production, Studio Monitor recorder ever built. It combines a 19" HDR 1200nit 10.2 Stop panel with 4K 12bit Raw or 10bit 422 ProRes/DNxHR recording and playback. 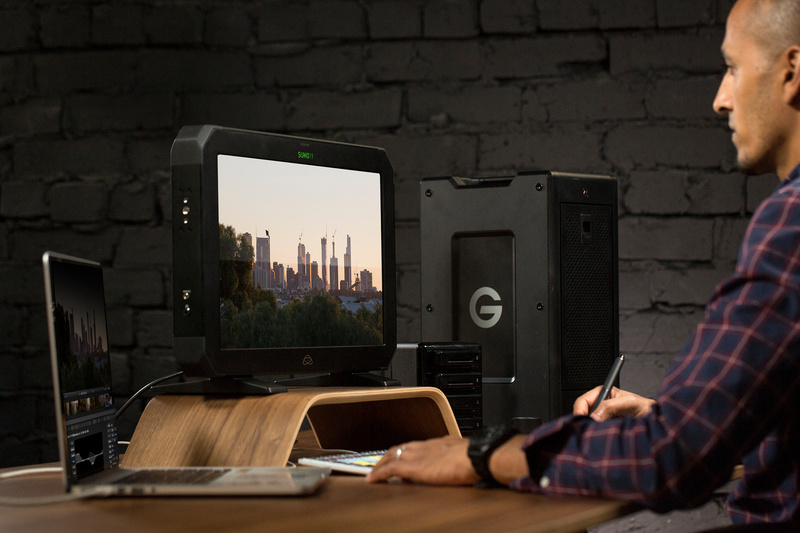 It gives clients and crew on set instant access to review recorded content in HDR quality and doubles as a grading and editing monitor for laptops in the field. Atomos' patent pending continuous power system using Anton bauer or V-lock batteries means your never without juice. Loadable 3D LUT's, market leading HDR viewing, high bright daylight viewing and all the assist tools the pro's require. This is a true on set and in studio revolution. Sumo's 19" 1920x1080 10-bit LCD panel is driven by the AtomHDR engine which precisely maps Log/PQ/HLG from every popular camera/game console or TV maker to perfectly resolve 10+ stops of HDR in real time. HDR comes to life on this incredible monitor or out to larger displays or TV's for affordable HDR studio grading from any NLE or grading suite. Capture the RAW output from Sony FS5/FS7/FS700, Canon C300MKII/ C500 or Panasonic Varicam LT over SDI up to 12-bit 4Kp30 as CDNG or up to 10-bit ProRes 4Kp60 / 2Kp240 depending on the camera's capability. Pristine quality is preserved at amazing data rates of up to 3.2 Gbps. Video is captured as either Apple ProRes or DNxHR in 10-bit 4:2:2 quality. The extremely bright 1200 nits display means you can accurately monitor, even when outside in full daylight. All monitors drift in color and brightness over time, which is why all high end monitors have calibration, Sumo gives you this reliability for free. Use X-Rite's i1DisplayPro, the professional's choice for ongoing accurate HDR and Rec709 monitoring. Seamlessly connect any SDI or HDMI device and convert between HDMI 2.0 & 3G Quadlink/6G/12G in any combination. Quad SDI inputs connect cameras with multiple 1.5 or 3G SDI outputs without the need for converters. HDMI 2.0 supports up to 4Kp60 I/O and the full suite of Atomos latest open protocol 3.0 supporting HDR automation and camera control.